As I write about resolutions for this week, my mouth is on fire! These puppies are HOT! And that was after only three. 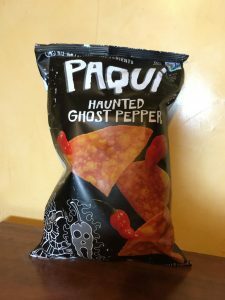 That being said, this weeks new resolution are the Paqui Haunted Ghost Pepper Nachos. I love hot things. Hot buffalo wings, hot chips, hot sausages, etc. I used to devour the Lay’s Flamin’ Hot chips all the time, now they are too hard to find. My order of Chinese food would always include the terms “extra spicy”. This is not me being braggadocios here, I am simply laying the foundation for the scale as to exactly how hot these nachos are. Some people can’t handle spicy food and that is ok. For me, I think it is the endorphins released when I eat spicy food; it makes me all warm and fuzzy inside. I can feel the fire dragon tickling my stomach when I eat spicy food and that makes me happy. Of course, it is not just the spice for me, it is the flavor as well. I don’t really care for something that is spicy just to be spicy. If that were the case, I would just pour myself a glass of Sriracha or other hot pepper sauce and drink it straight. That is neither appetizing nor is it smart. The flavor of the nachos is like that of other chili peppers. Behind the heat, there is a hint of sweetness. Overall, the flavor is enjoyable. This is a flavor that I would chose even if there was no heat to it. Last week, as part of the resolutions series, I tried Kame Rice Crackers. I went two weeks in a row of something that I did not care for. The crackers were just the opposite of the nacho chips above. There was no flavor at all; they reminded me of Rice Cakes, remember those? I believe the phrase “Eating packing peanuts” came to mind. I would not eat these again, but hey, if eating paper is your thing, go for it.